Social Occasions by Mon Cheri 119827 Chic Boutique: Largest Selection of Prom, Evening, Homecoming, Quinceanera, Cocktail dresses & accessories. 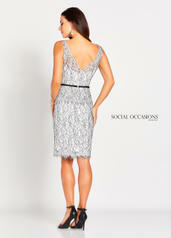 The fabric in this Social Occasions by Mon Cheri style is Allover Lace & Beading. Matching Separate short sleeves included.